Any day now (mid-July 2014) Toronto City Council will be considering whether to mandate signage for POPS which would make clear that they are for public use. Unbelievably, until now this was not policy. POPS can exist unacknowledged, as ambiguous entities below the radar of our consciousness. Some are virtually invisible. Or if not, even worse, we can see a lovely little space, but are we allowed in? Is it private? Can’t tell. We’re not invited. If they’re for everybody then why don’t we know it? Councillor Josh Matlow’s motion would address this with signs welcoming the public. That’s a step. We need signs. We need maps. We need smart phone apps. But why are these spaces private at all? The city acquires POPS as concessions from developers in exchange for increased density. Why don’t they just take a slice of the property and own it? What is the advantage to the city of leaving it in private hands? Don’t developers sometimes want it back after time when the site is redeveloped? (Apparently that just happened at Yonge and Eglinton, where the open north-west corner is now being enclosed for additional commercial space.) If there are to be negotiations to gain public amenities from developers, how about exerting a little muscle for the collective good? We can’t be overly polite about this. The city belongs to those who live here and open, public space benefits everyone. Torontonians have to claim these places, use them, take for granted that we can be there. Stick out our elbows. Make them indisputably and irretrievably public. A covered passageway between Yonge and Bay, this Galleria designed by Santiago Calatrava is thrilling in scale, the supports for the arching roof suggest tree shapes. Its graceful soaring height is often a venue for art installations, such as this for Luminato 2014. Amidst the cafe umbrellas, a tiny wilderness harbouring the scent of pines and sound of water. 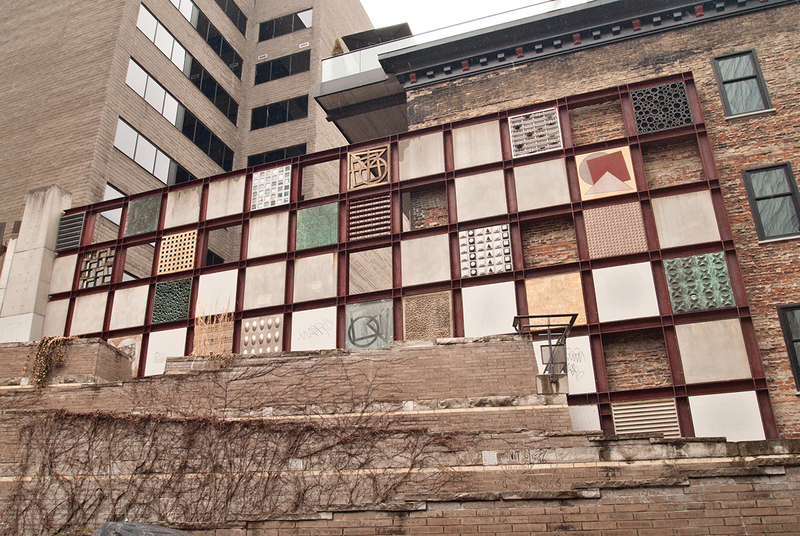 The Monument to Construction Workers is a sampler of all the skilled work comprising the downtown high-rises around it, each panel built by the trade it represents. This space also has a waterfall and a humid rainforest in a glass conservatory. On either side of this downtown hotel is a POPS walkway that allows pedestrians to go between David Pecaut Square and Simcoe Park. In warm weather the fountain plays as the elephants head toward it. An oasis unknown to most except those who work in the surrounding buildings. Mies van der Rohe’s famous black towers have a cow pasture in the grass at their bases. More about POPS from the Toronto Star and the Globe and Mail.